Think you know what’s happening around the world? 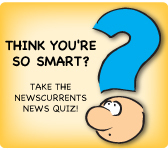 Challenge yourself with the NewsCurrents News Quiz. Brought to you by the folks at NewsCurrents–hot and fresh every Monday! Next Makeup Forever by Caroline T.